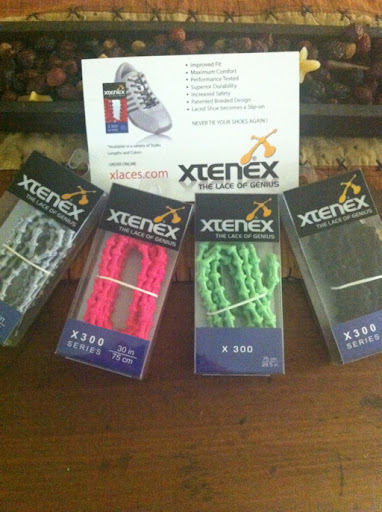 So a couple weeks ago, I did a Gear Junky Thursday talking about Xtenex laces & how much I love them! Well, because of some glitch with my order, they sent me a free pair & of course, I’d ordered a few pairs for me… Well, I’ve had such a crappy couple of days, I thought I’d make someone else’s day! Like I said before, these things are great – they released as my foot swelled while running & there’s no plastic things or tying required! For each thing, write it in my comments section & it’ll be an entry. 3. Re-tweet, FB, put on your blog (if you do all 3, it’ll be 3 entries. 4. Like Xtenex Corp on Facebook. You go girl – love all the new product ideas you give!! I am constantly looking for decent running laces!I gave this a +1 on Google, Tweeted it, posted it on Facebook, posted it on my blog (http://www.philrules.com/db/?p=51), followed you on Twitter, liked Xtenex Corp, and although I couldn't figure out how to 'follow' the blog, I added it to my Google Reader. Put me in for a blog follow, a twitter follow and a retweet! Follow, fb repost and thumbs up to xtenex. Pick me! !Hope to see you soon! Am I too late?? I am a follower, because of twitter, which I follow you on that as well. Nope! not to late. Will be cutting off at 5p CTZ and then announcing soon after! 🙂 Good luck all! !